I got a Bose ® SoundLink Bluetooth Speaker III for Christmas, with which I am well pleased. Since my phone is the player most of the time - either for music, radio or the recordings I preview for the Guardian Guide - it suits me to be able to pair it with a speaker that's easy to take around the house. Yesterday I was talking to two younger blokes, who'd also got expensive items of audio equipment for Christmas. 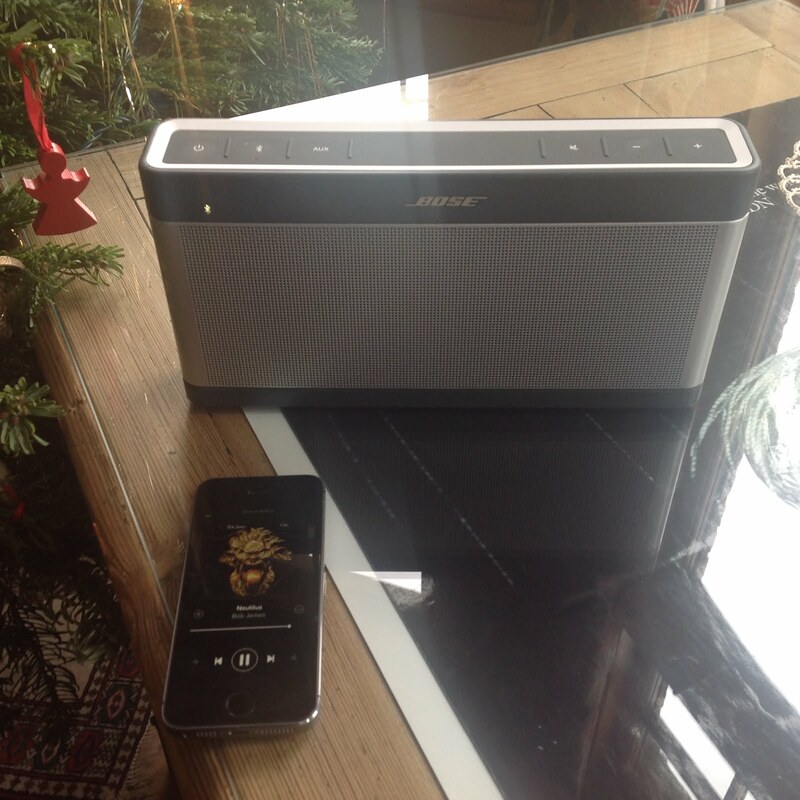 One was a Harman/Kardon Onyx Studio Wireless Bluetooth Speaker ; the other was Sonos PLAY:1 Black - The Wireless Hi-Fi . It's interesting how the things that were once important - things such as lots of speakers - are no longer an issue. I was talking to Alan Parsons recently about the amount of investment in quadrophonic in the mid-70s. It was just assumed that people would want a more sophisticated of what they had already. If you think two speakers are great, try four. It wasn't what they wanted at all. I dimly remember a comedy sketch from the 70s where the gag was, "why not get rid of all these speakers and just have the music all coming from one place?" Bob James *One*. Of course! I never enjoyed music more than when it was emanating from the tinny speakers of my red Sharp QT 27 radio cassette player. I still own it and see it occasionally whenever I venture into the loft. Quality speakers may reveal unheard layers of nuance, and breathe life into familiar material, but they won't make a bad song good. Another lump of non-fidelity soundcrap is the stuff that comes with the babble that, now fully remastered, after 50 years we can finally hear it as it was meant to be heard. By whom? Not me. And whoever was it that thought it was a good idea to have one voice/instrument coming out of the speaker in front of me and the harmony/bass/whatever coming from the far corner of the room? I’m all for a bit of stereo, but this is gimmickry gone mad. Interesting comments. Over the ears I have spent thousands on my stereo. I recommended a Naim Muso to a friend of mine whose old B&O system had died. He bought it as an ex-demo for £650 and once we got it working in his house we spent hours playing our favourite music. Hours later we agreed simple is best. Anyone who's looking for a one box solution could do a lot worse! I think generally, anything in stereo (from the UK in particular)before 1968, is an interesting, but not great listen. The Beatles catalogue is a good example of this. Having bought the lps in mono right up to the White Album, hearing the stereo mixes was disappointing to say the least. Even George Martin's stereo remixes of Help and Rubber Soul in 1987 (you remember, those appalling, almost unlistenable first cd issues) weren't that good. Generally, I'm not one for tampering with the original releases..if the mono's available, that's usually the best option. However, having just listened to the new stereo mixes from the 1 cd and video set, I have to say they sound tremendous. I'm thinking this could well be the next Beatles money grab..Giles Martin remixing all the stereo stuff up to Abbey Road!!!! ...the gag was, "why not get rid of all these speakers and just have the music all coming from one place?" Thinking about it over the last few days I, too, have a vague recollection of something of this sort, but I'm wondering if it was simply a gag/sketch, or a comic advert extolling the virtues of some music centre or other. As I say, just wondering. Regarding new years resolutions, they say the best exercise / diet regime is the one you'll actually do. I suppose the same applies to speakers. I listen to most stuff off my phone these days - its just more convenient than the proper stereo, regardless of the quality.